(CNN) -- Rain lashed parts of the Philippines on Saturday as Typhoon Hagupit barreled toward the coast, bringing roaring winds and the threat of massive storm surges. Satellite images show the eye of the storm, which lost its super typhoon status again Saturday, about 250 kilometers (150 miles) off the eastern coast of the island nation. The storm, the strongest so far this year, is expected to make landfall Saturday evening or Sunday morning, local time, over the Eastern Samar to Northern Samar area, according to the Philippine Atmospheric, Geophysical and Astronomical Services Administration (PAGASA). It's packing sustained winds of 175 kilometers an hour (109 mph) near the storm's center, with gusts of up to 230 kph (143 mph). How does CNN forecast typhoons? Millions of people have been scrambling to get out of the typhoon's way, or battening down in hotels on higher ground, away from the coast. Public storm warning signals have been applied in a number of provinces amid predictions winds could rip off roofs, cut power and damage buildings. Residents in low-lying areas have been warned about possible flash floods and landslides. While current forecasts show the storm skirting north of Tacloban, the people there aren't taking any chances. They suffered enormously when Super Typhoon Haiyan smashed into the coast last November, killing more than 6,000 people and creating apocalyptic scenes of splintered houses, ships on streets and and debris piles for as far as the eye could see. 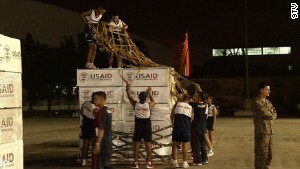 Tacloban Mayor Alfred Romualdez said they're better prepared this year after learning the lessons of Haiyan a year ago. Residents are taking the storm warnings seriously and most people have fled the city, he said. This time, Hagupit, known locally as Typhoon Ruby, is expected to cross the coast farther north, toward Legazpi. Officials there expected to evacuate an estimated 75,000 people ahead of the typhoon's arrival, Mayor Noel Rosal said Friday. "There's a danger that there will be heavy rains for about four hours and I am very, very worried at this moment," Rosal said. Most forecasters predict the storm will move northwest through the island nation after landfall, passing south of the capital city of Manila. PAGASA projects that the storm will exit the country on Wednesday. Hagupit, the name used by World Meteorological Organization, means "lash" in Filipino. With the storm fast approaching, authorities are not only worried about the typhoon itself, but the effects of the fierce winds, possible flooding and storm surge. PAGASA warned of intense rainfall between 7.5 millimeters and 20 millimeters per hour and rough seas. It also warned of storm surge that could reach up to 5 meters (16 feet) high. More than 80 domestic flights were canceled, according to the National Disaster Risk Reduction and Management Council. Schools, businesses and government offices closed at the end of the week to give people time to prepare. Government agencies stockpiled tens of thousands of canned food packages in case of shortages. Shop owners nailed boards on windows to protect them from wind, while fishermen moved boats onto dry land. Many Filipinos took to social media to spread warnings and urge one another to prepare and pray for the country. "Hoping for the best, expecting the worst," Twitter user jinglebelles17 posted. Get the latest satellite images and data as CNN tracks Typhoon Hagupit. CNN reporters Saima Mohsin and Andrew Stevens report from Legapzi and Tacloban amid heavy rain, wind. 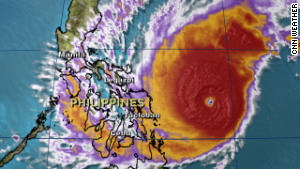 CNN Meteorologist Tom Sater tracks the path of Typhoon Hagupit as it drenches the Philippines. The typhoon sends thousands of people into shelters amid pouring rain that heightens the risk of flooding and landslides. Powered by ferocious winds, Typhoon Hagupit is whipping towards central Philippines and could affect the same area hit by the deadly Typhoon Haiyan just 13 months ago. A year after Haiyan ravaged Tacloban, its residents again prepare for a huge storm. CNN affiliate 9TV reports. Typhoon Hagupit is bearing down on the Philippines. 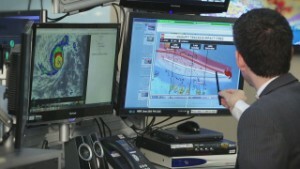 Meteorologist Tom Sater looks at where it might make landfall. Filmmaker and Philippine native Jeff Manibay shares his personal story of surviving Typhoon Haiyan. Meteorologist Tom Sater looks back at the chaos brought by Typhoon Haiyan one year after it devastated the Philippines. A dozen body bags line the street in Tacloban -- one of the towns hardest hit by Super Typhoon Haiyan -- as locals walk through the destruction of what used to be their homes. CNN's Airmie Jarin-Bennett, an expat Filipino, returned to her native land after Typhoon Haiyan. Nothing prepared her for what she found there. Karl Penhaul reports from the middle of the Tacloban devastation using a drone camera to get a bird's eye view. Explore stories from typhoon survivors, relief workers, and officials from eight regions across the Philippines. This video shows how strong the storm surge was during Super Typhoon Haiyan. The storm affected 4.3 million people in 36 provinces and displaced more than 340,000.